Service Chiefs led by the Chief of Defence Staff have converged on Ojoloma Jetty in Okrika under 82 Division of the Nigerian Army to step up security operations in the Niger Delta. 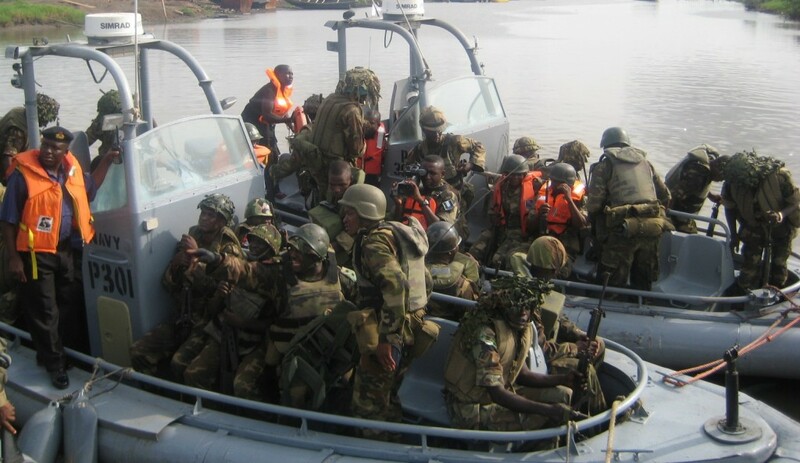 The Chief of Army Staff, Lt Gen Tukur Buratai, said that the commissioning of refurbished gunboats is part of collaborative efforts to provide the needed equipment to combat the security challenges in the oil rich region. The Chief of Defence Staff, General Gabriel Abayomi Olonisakin said that these gunboats refurbished by 2 Brigade Nigerian Army would improve the capacity to curtail security threats in Nigeria’s inland waterways. Attacks on facilities in the last few weeks have driven Nigeria’s oil output to a more than 20-year low. A crude oil pipeline in Bayelsa State, southern Nigeria, operated by the local subsidiary of Italy’s Eni, Nigerian Agip Oil, was attacked by suspected militants at the weekend. This was barely two weeks after militants attacked a Chevron platform also in the Niger Delta region. A group known as the Niger Delta Avengers claimed responsibility for the attack. The same group said it carried out an attack on a Shell Oil pipeline in February which shut down the 250,000 barrel-a-day Forcados export terminal. The group has been in the news lately for being behind the attacks on oil and gas facilities in the region. President Muhammadu Buhari has assured oil companies operating in the Niger Delta that the government was taking all necessary actions to protect strategic assets in the region from vandals and criminals.